Heritage Creek Golf Club is a Bucks County golf course offering a fun golf experience with quality play in a beautiful setting. The Heritage Creek Golf Club features wide open views and rolling, countryside appeal. 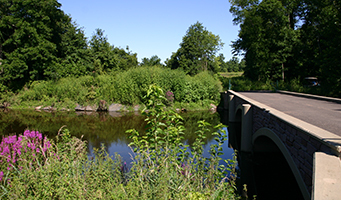 The Heritage Creek Golf Club is located in Jamsion in the heart of Central Bucks County. The natural topography of this delicate landscape has been gently shaped to create a challenging Par 34. Emerald green fairways nestled along the Little Neshaminy Creek, unspoiled wetlands and lush forest provide a truly bucolic Bucks County golf experience. Large undulating greens with two daily pin positions, four sets of tees, bentgrass from tee to green, and many pot bunkers, offers golfers a variety of play that makes Heritage Creek Golf Club one of Bucks County’s favorite 9-hole golf courses.